Inventory We are a resale marketplace, not a box office or venue. Ticket prices may exceed face value. This site is not owned by Chicago Theater . The Chicago Theatre is one of the most iconic Theater buildings in the United States. Finished in 1921, the Chicago Theatre was referred to as the Balaban and Katz Chicago Theatre. The Chicago Theatre box office is located on the North State Street in the loop area of Chicago. The most popular Chicago Theater tickets are currently to comedy shows, stage plays, premier touring concert artists, magic shows, and speeches. 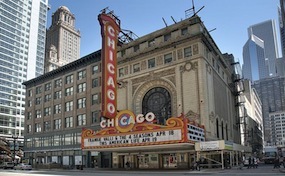 The Chicago Theater has been added to the National Register of Historic Places in 1979. In 1986 the Chicago Theatre went through a massive $9 million renovation. The current Chicago Theater seating capacity is 3,600. ChicagoTicketOffice.com is a privately owned and operated company that specializes in the online sales of all secondary market inventory. Our prices may be below or above face value. All sales come with our unconditional 100% authenticity money back guarantee. To order all Chicago Theatre events simply call our operators at anytime or navigate the site to select your desired tickets.